Science Fiction Geeks - Scifi News: Damon Lindelof & Carlton Cuse on Jimmy Kimmel - Answers and Spoilers about LOST - S6E1 and Theories! Damon Lindelof & Carlton Cuse on Jimmy Kimmel - Answers and Spoilers about LOST - S6E1 and Theories! 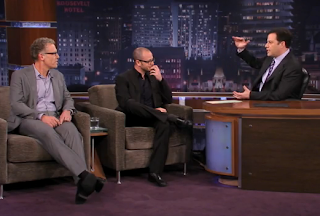 Damon Lindelof and Carlton Cuse were on Jimmy Kimmel last night, Feb 2nd, 2010 talking about the snow. Kimmel asked them all sorts of questions about the episode and the general theories of the show.